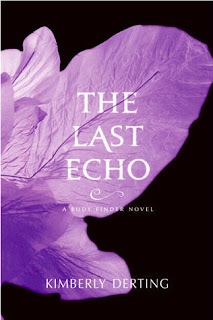 Summary: In the end, all that’s left is an echo. When Violet discovers the body of a college girl killed by “the girlfriend collector” she is determined to solve the case. But now the serial killer is on the lookout for a new “relationship” and Violet may have caught his eye. My Thoughts: And I thought The Body Finder and Desires Of The Dead were awesome books. The Last Echo is by far the best in the series so far. We are back with Violet who can see imprints. Remember, she can see the imprints of dead people on the killers bodies. Jay, her super cool boyfriend is also around throughout the novel. He is there to help Violet get through life with her special abilities. Violet is working with a group of people who have similar abilities to hers. There is Sam, Sarah, Rafe, Gemma, and Krystal. Each person contributes to the group in their own way. The Last Echo has a few bad guys dipped in. First, there is James Nu, who killed his whole family. He and Violet run into each other and he takes a liking to her, and is drawn to her. Yuck. Than, there is the main bad guy. I won't say his name but he is known as The Girlfriend Collector, creepy much? His goal is to find a girl who will love him. And none of them do the job to his liking so he has to move on to the next one. Just like the other novels, we see into his head and get to go through the motions with him. We get to see him pick out his victims, bathe his victims, feed his victims, and than dispose of his victims. Yuck. And the worst, we know one of the girls who becomes his victim! As far as bad guys go, he's definitely creepy and the whole book I wanted the team to find him and fix the problem, so he can't hurt anymore girls. A lot of people are mentioning love triangles for this book? Is there one? I won't tell! But yes, Rafe is more in this book and he is nicer around V and he actually seems like he's starting to care. He is always so aloof and keeps to himself, it’s hard to really ever know what the guy is thinking. Yes, he and V do share a bond since their abilities connect them, and they relate to each other. Am I Team Rafe or Team Jay? I honestly don't know. I like them both in their own ways. Does the team catch the killer? Before its too late? Does Violet ever have a normal life? With normal friends, a normal family, and a normal boyfriend? Of should she just accept that she's different. The Last Echo is the best in the series this far and I can't wait to see what Derting has in store for us next. Overall: Loved it! I read it all in one sitting! I just can't believe how good these books are! There is just something about them that amazes me. Violet is such a likable character and I'm always rooting for her. And than all the new characters thrown in, are so wonderful and independent and mysterious! Loved this one! Cover: Adorable! All these covers are very pretty! Love the purple!